Anything Goes opens up the Best of Broadway season. "In olden days a glimpse of stocking / was looked upon as something shocking / but now, God knows, / anything goes," run the lines to Cole Porter's tune "Anything Goes," which was written for the 1934 musical of the same name. Penned in the thick of the socioeconomic upheaval of the Great Depression, Porter's characteristically spry couplets express a familiar (and glibly tongue-in-cheek) lament over the permissiveness of contemporary society relative to some past golden age, all while lampooning the high-society figures of that era. Those same lines also try to make sense of the madcap farce that's playing out onstage — one where a mild-mannered Wall Street broker boards a cruise ship and finds himself pretending to be a notorious gangster, and where romances ebb and flow like the ocean tide. 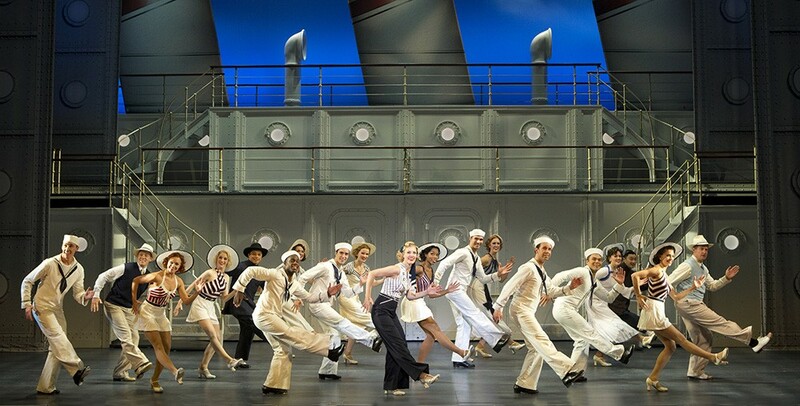 Anything Goes was one of the first generation of productions that today's audiences would recognize as a proper Broadway musical, in which song and dance are a cohesive part of the narrative. Despite its age, it has remained an audience favorite throughout its almost 80-year history. That's due in large part to Porter's "timeless" music and wit, says Josh Franklin, who plays the aforementioned Wall Street broker named Billy Crocker. "Cole Porter was ahead of his time in a lot of ways," he says. "Some of the jokes in his lyrics were initially inside jokes written for a small group of people, but we get the references even more nowadays." To keep Anything Goes limber, its libretto has been subject to several revisions: first in 1962, then in 1987 and most recently in 2011, which is the multiple Tony Award-winning version that will be coming to the INB Performing Arts Center as part of the Best of Broadway series. "The little tweaks in the script have been really beneficial," says Franklin. "In some ways they went back to the original formula. We have the character Erma, who sings 'Buddie, Beware.'" This revision also brings back "Gypsy in Me" from the 1934 production and cuts "Let's Misbehave," first introduced in the 1962 revival. For Franklin, who's become a favorite casting choice of Anything Goes director and choreographer Kathleen Marshall and has seen his star ascend rapidly both as an actor and a recording artist, much of this is euphorically new. He leapt from ensemble and understudy roles in national productions of Legally Blonde and All Shook Up to playing Bob Gaudio in Jersey Boys, the jukebox musical chronicling the career arc of the Four Seasons. It was a leap he almost didn't make. "I didn't really see it coming," he says. "I was doing Legally Blonde, understudying on Broadway, and I was focusing on writing a musical and also my singer/songwriter stuff. And for a second there I thought, 'I'm done with performing. I'm going to sit back and write.'" That's when his agent called with an audition for Jersey Boys. By the following morning, he'd been cast as the show's lead. Although Anything Goes is the first classical musical he's done and is "vastly different" to Jersey Boys in its style ("I've not danced quite this much," Franklin chuckles), he's noticed considerable audience overlap. "It's interesting to watch," he says. "The same young theater fans that go crazy for Jersey Boys or Wicked or any of these big pop musicals are loving this. There are some of the corniest jokes ever, but they're so funny in the world of the show."